Sunday’s election of opposition candidate Mauricio Macri marks a moment investors have been waiting for in Argentina for a long time. 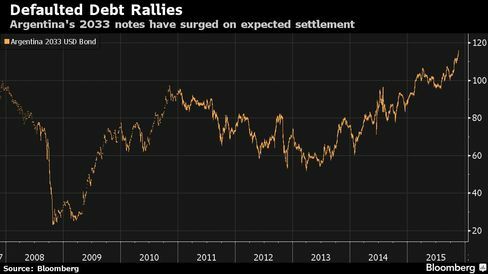 In the 14 years since the country carried out the biggest default the world had ever seen, international investors watched an economy that had long been one of their favorites turn into a pariah in global capital markets. Under the Kirchners — first Nestor and then his wife, Cristina — Argentina became best known for its byzantine foreign-exchange system, the seizure of privately-owned assets and the under-reporting of inflation. Investor excitement is tangible, a rarity nowadays in a region that’s suddenly fallen out of favor. Companies, including Germany’s BayWa AG and Brazil’s BRF SA, are prepping to expand their presence in the country and Argentina’s benchmark stock index soared more than 30 percent in the past three months as traders anticipated a Macri victory. Even the country’s defaulted debt — the government fell back into default last year on legal grounds stemming from the 2001 debacle — has been rallying, with prices on benchmark bonds climbing well over par value. Eager to reinsert the country in foreign markets, Macri has said that settling the old debts will be a top priority after he’s sworn in as president on Dec. 10. The challenges indeed are substantial: foreign reserves are at a nine-year low; prices on the country’s commodity exports are depressed; the budget deficit is soaring to the widest in three decades; and inflation, as tallied by private economists, is running at an annual pace of more than 20 percent. This is not the first time, of course, that foreign investors have piled into Argentina. In a country that was once one of the world’s richest (back around the turn of the 20th century), there have been countless booms and busts. Most recently, the nation became the darling of the investing world in the 1990s, when President Carlos Menem tamed hyperinflation, sold off state assets and opened up the economy….There’s no shortage of big-name investors — George Soros, Daniel Loeb and Richard Perry, to name a few — betting on him successfully resolving the debt dispute and regaining access to international credit markets.